Addressing a lack of space in their home is one of the most common ambitions of homeowners. 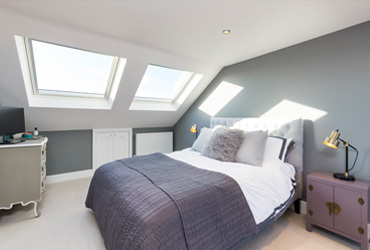 For an additional bedroom, more living, working or storage space, a loft conversion is a superb and often very simple way of creating extra space within your home. Not only does this naturally improve the experience of your and your family in your home, but can also be a sound investment, adding value to your property, especially relevant to Leatherhead residents. If you’re a homeowner who doesn’t want to upheaval of moving house, with all the commuter, practical and familial concerns that go along with a move, then unlocking the potential in your current property through a loft conversion is a sensible option. We strain to make the process of the work from beginning to completion cause as little disruption as possible, leaving you with a stunning new addition to your property. With the ever rising cost of land in the surrounding area, having the external space on your property to add an extension to your house is often unlikely and even for those who have space, the additional red tape and planning permission concerns pose extra complications and challenges. Such problems are far rarer in developing a loft space and conversion can create extra space within your property without the need for significant external work being required. Planning consents are typically only required in select circumstances, such as for listed buildings and in some conservation areas, which might be of consideration to some Leatherhead residents. By employing a specialist such as Berry Construction, we not only undertake the construction work to an exceptional standard, but we’ll also assist with these more complex areas of planning to make sure that you’ve got the guidance you need throughout the process. Creating extra space within a property is especially valuable to families who are growing. As your family gets bigger, so should your home and a loft conversion can both offer a new bedroom or alternatively can free space elsewhere in your home to become a bedroom. Unused space in your attic is ripe for transformation and can really improve your enjoyment of your home. With an increasing pattern of professionals working from home, with the latest technological improvements making communication and data access more secure and straight forward, the addition of a specially fitted working space in your home can be a welcome improvement to improve both your home and working life. Creating a practical space in your loft not only provides you with well fitted office space for work but allows for a separation between the living space elsewhere in your house and your new office. Another possibility for consideration for those who have the opportunity is the conversion of outside roof space. This combines the benefits of a more traditional extension whilst also not taking any additional ground space. Again, the options here are numerous, with new living, recreational or storage space being effective uses of space and as ever our team our always here to advise on any planning or permission issues. We focus on delivering an exceptional level of service and in ensuring that you get the greatest possible benefit from your space. 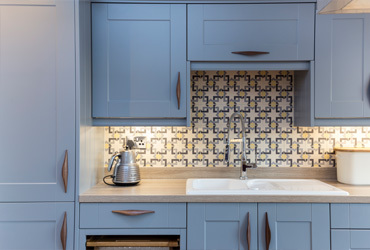 We listen carefully to your needs and concerns and work closely with all our clients from the initial planning and design work through the building and finishing to ensure that the final outcome is what you were hoping for. Our experienced team has significant expertise in working on properties in the region and we are proud of the reputation we’ve earned over this time. 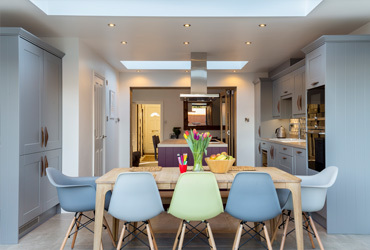 Have a look through the testimonials on our site to find out more about the service we offer from satisfied customers and get in touch with our team today to see what we can do to transform your loft space.